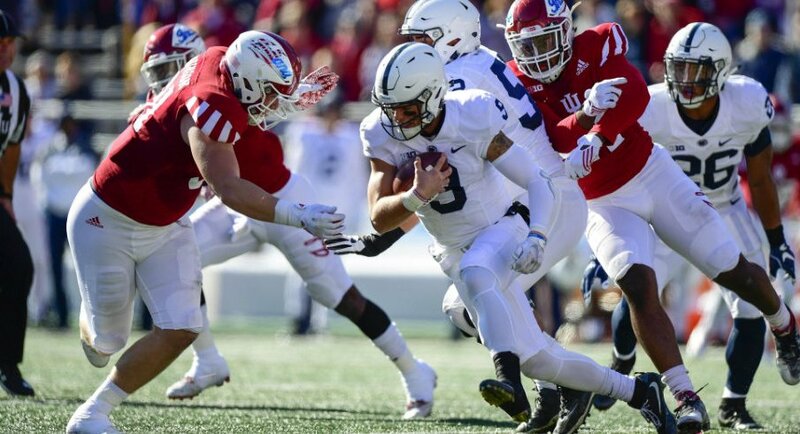 Both Penn State and Indiana are coming off consecutive losses to Big Ten opponents. Both teams have QBs on their roster that committed to IU in high school. Using S&P+, both teams are projected to lose to Michigan later this year. Both teams are led in rushing by freshmen. Ok, I think I’m done here. Looks like it should be a closely contested contest. Let’s do some picks, mmmkay? Stuff rate is the percentage of runs where the runner is tackled at or behind the line of scrimmage. Indiana is 75th nationally at 19.4%. Stevie Scott has the majority of the carries and the lowest stuff rate on the team at 14%. [ref]Except for Michael Penix and Whop Philyor who each have 3 non-garbage time rushes. [/ref] The rest of the team is stuffed a lot more frequently. Quarterback Peyton Ramsey has the next most carries on the team, but is stuffed on 26% of his non-scramble rushes. [ref]For reference, this over/under includes only non-scramble rushes. [/ref] Penn State has been elite with a 27.1% stuff rate that ranks 9th nationally. Indiana is averaging just 3.8 points per scoring opportunity this year. An inability to perform deep in opponent territory has had a lot to do with that. Indiana’s success rate inside the 10 yard line has left a lot to be desired. They rank 117th nationally at 39%. In non-garbage time[ref]Defined here as when a game is not within 28 points in the first quarter, 24 in the second, 21 in the third, or 16 in the fourth. [/ref] Indiana is slightly better at 44%. The Hoosiers have passed 21 times for a 48% success rate and rushed 15 times for a 40% success rate. Eleven receivers have seen a target from inside the 10 with Nick Westbrook (6) and Donovan Hale (3) as the only receivers to see more than 2 targets. Penn State is 10th nationally in success rate inside the 10 at 33.3%. McSorley has 19 rushes on 3rd down with 8 of them going for a first down. Compare that 42% conversion rate with the 22% rate put up by Peyton Ramsey and it is evident that McSorley’s mobility could pose a problem for the Hoosiers. He leads Big Ten QBs in rushing this year with 496 non-sack rushing yards. If they have any chance at winning, the IU defense needs to force stops and get off the field. Indiana is allowing a conversion on 38% of 3rd down rushes although only 28% in Big Ten play. Indiana has allowed their last 3 opponents to score on their opening drive and 4 of 7 opponents overall. Last season, Saquon Barkley returned the opening kickoff for a touchdown. The margin for error in this game is so slim that Indiana can barely afford to fall behind early. Jake Pinegar, the freshman kicker for the Nittany Lions, has had a slow start to the season. While he hasn’t missed an extra point going a perfect 35 of 35, he’s missed 4 of 8 field goals. Distance has been an issue with Pinegar going 0 of 3 at or beyond 40 yards. His long is 39. There is talk that he might even be replaced. This one may come down to how many field goals Penn State actually attempts. Indiana has faced the fewest number of field goal attempts in the nation at just 3. This is mostly due to Indiana’s inability to bend without breaking. The Hoosiers are allowing 5.53 points per scoring opportunity, 124th nationally. Vegas opened with Penn State as a 14 point favorite. Bill Connelly at Football Study Hall also has Penn State as a 14.3 point favorite. If you are picking the over, you are picking Penn State to win by 15+ points. If you are picking the under, you are picking Penn State to lose or win by 14 or fewer points. This over/under is worth 2 points so make it a good one. Please register for the site and then the pick selection will appear.